Nothing's more frustrating than to hit the right shot with the wrong club. In any round of golf you will have to make dozens of decisions regarding the proper club to hit, so it pays to know how to move beyond pure yardage and consider the more subtle factors. 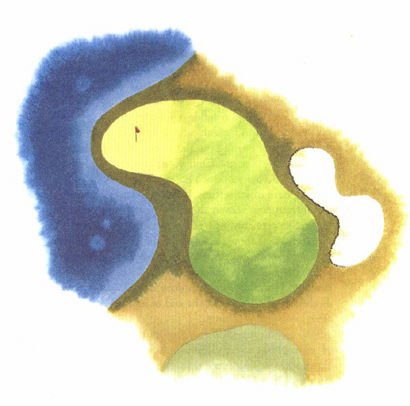 Take the shorter club when (1) you're playing downhill or downwind; (2) you're playing on dry, hard fairways, (3) you're excited, angry, or for whatever reason your adrenalin is pumping; (4) the worst greenside trouble is beyond the green; (5) you're basically an aggressive player like me and you're most comfortable hitting shots full bore; (6) you're playing an intentional draw or hook; and (7) you have a lie in light rough which will likely produce a flyer. Take the longer club when (1) you're playing into the wind or uphill; (2) you're playing to soft greens with no roll; (3) you're in a fairway bunker; (4) the worst greenside trouble Is short of the green; (5) you're playing an intentional fade or slice; (6) you're a smooth-swinging player and you're most comfortable swinging within yourself.